Are your people working hard yet need to make more progress and deliver better results? To succeed in today’s fast-changing business environment, team leaders can’t wait for annual planning and performance reviews to get the job done. They need to make the most of agile and collaborative decision-making at all times. Julia’s expertise, based on experience and research, draws out and aligns collective best thinking as she expertly navigates through resistance and disagreement. With twenty-five years of experience in psychology and business, she leads teams to the strategic decisions and practical action plans that move the organization forward. Does your team need to change the status quo in order to achieve strategic growth? That is the leadership challenge Julia addresses with the organizational decision-making framework she has honed from research and decades of experience. 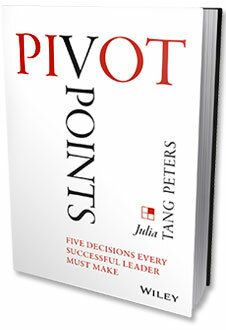 Get started with Leadership Pivot Planning, working with Julia one-on-one to gain focus, clarity and conviction for what you have to do. You will then be energized for a Leadership Summit meeting with your team, when Julia takes you and your team through the structured process for collaborative decision-making that reconciles different perspectives and needs. Outcomes include decisions and an action plan based on shared ownership for achieving short-term goals and long-term vision. Separate the short-term noise from what matters for long-term growth, solve the right problems, explore options, make decisions, and execute those decisions with accountability and adaptability. Secure support from stakeholders with a communications plan for messaging, rollout, and updates. Set the team on a collaborative path of execution and problem solving for measurable progress in delivering to goals. Is your organization stuck in the way things have always been done? The toughest challenges of leading are insular thinking and organizational complacency, especially when facing bold business goals. Often, the solution involves restructuring the organization and redefining roles and responsibilities. Julia works with leaders and their teams on developing a custom-fit structure and process to move the team forward. Identify blind spots and outdated corporate habits that have constrained the organization’s performance. Address gaps in skills, underperforming functions, and misalignment of accountabilities. Introduce a fresh perspective of roles and responsibilities in the new organization structure and workflow process. Do you want a culture where everyone can develop more as leaders? Seasoned executives know the art of leadership is to create more leaders in their organization, because they are only as effective as their team. Applying her research-based assessment of leadership attitudes and behaviors, Julia helps people step up to take on more leadership accountability. Identify the essential issues for leadership development of individuals and of the group. Align key performance indicators to leadership principles to help people understand how to succeed in your organization. Optimize the role of positive influencers as well as resolve difficult people issues through Julia’s coaching. Copyright © 2016 Julia Tang Peters. | All Rights Reserved.